This article will aid you to remove the Microsoft System Security Alert scam fully. Follow the tech support scam removal instructions given at the end of the article. Microsoft System Security Alert is a message seen on various websites that host a tech support scam with a phone number that allegedly belongs to Microsoft support. Pop-ups that show constantly lock your browser on that current landing page. The browser can be shut down in some cases, without any negative effects, but in other ones your computer and browser might get affected further with more malware. Most variants of this scam feature a background image that aims to look like an official Microsoft System Security Alert. Do not call any phone numbers and read more about the scam below. 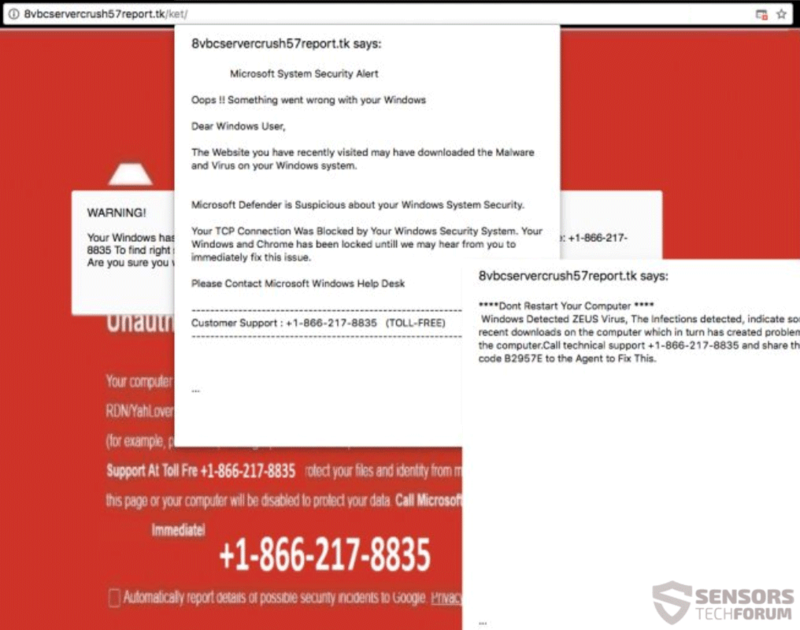 Short Description A number of tech support scams trying to scare you that you have a legitimate Microsoft System Security Alert about a virus found on your PC. You are provided with a phone number to a supposed Microsoft tech support team. Symptoms Pop-up boxes, messages, and redirects appear in your browser. It is not excluded for there to be a lock-screen function among these, or your PC freezing because of the activity going on in your browser related to the scam. User Experience Join Our Forum to Discuss Microsoft System Security Alert. Browsing the Web can be dangerous, especially when you reach new and unknown websites by causally browsing and they turn out to be malicious. Clicking on advertisements or targeted content could have hidden links that redirect you to dubious online places. That is the most common way in which this kind of a tech support scam can use for its spread. Other websites could be filled with advertisements and redirect links and you could land on a page which has the Microsoft System Security Alert message. One of the domains spreading this tech support scam is 8vlxervercrush57report.tk/ket/. Freeware applications, regarded as PUPs (potentially unwanted programs) could also distribute this sort of scam. Different software could cause the scareware to appear in your browsers or another related Microsoft Tech Support scam. Such websites usually come with third-party installations and freeware packages. These packages tend to have extra features selected for installation from the get-go. To avoid installing any additional features could be done if you find Advanced or a Custom settings. Microsoft System Security Alert is one of a few messages related to a tech support scam. The scam doesn’t differentiate much between the domains which are involved with it, but they use different phone numbers. The domain which is currently spreading a lot is 8vlxervercrush57report.tk/ket/. The Website you have recently visited may have downloaded the Malware and Virus on your Windows system. In case you see any of those messages, know that they aren’t official messages from Microsoft or any Windows related programs. Also, no matter how many pop-ups, alerts and message boxes are displayed, remember that this is just scareware that is trying to trick you into calling the 1-866-217-8835 phone number that goes along with the corresponding message. Other domains than 8vlxervercrush57report.tk/ket/ are involved with this scam, and you should pay more attention to sites you are visiting and if you think they are legitimate. Your browser or computer screen can become locked and may seem like your whole screen is blocked and totally inaccessible. In such a situation, you could try clicking the “Windows” button and combinations such as “Ctrl+Alt+Del” or even the “Close” button to check if you still can interact with your computer system. The scammers want to make you believe that the only way to fix your computer device is by calling one of the phone numbers, provided on your screen. They also will blatantly lie to you that they are an expert team of technicians and as already mentioned above, in most cases pretend to be Microsoft employees. Not even a small fraction of that is true. Also, note that most of the time the person on the other line has an Indian accent or is from India – that is not racist or discriminatory in this case, but sadly it may be true. The whole scam is made in a way to convince you into calling the provided telephone numbers, based firmly on scareware tactics. Do NOT call any of the phone numbers in any circumstance. It is not toll free as presented on the websites, and even the shortest of calls could cost you next to a small fortune. Moreover, while the con artists can present themselves as Microsoft employees or similar experts or even partners, they will try to acquire personal information and financial data from you. That information can be sold, and you could get into more problems, such as identity theft, your bank accounts getting emptied etc. To remove the Microsoft System Security Alert tech support scam and its related files manually from your PC, follow the step-by-step removal instructions provided below. If the manual removal guide does not get rid of the scam and its redirects completely, you should search for and remove any leftover items with an advanced anti-malware tool. Software like that will keep your system secure in the future. Threats such as Microsoft System Security Alert may be persistent. They tend to re-appear if not fully deleted. A malware removal tool like Combo Cleaner will help you to remove malicious programs, saving you the time and the struggle of tracking down numerous malicious files. Threats such as Microsoft System Security Alert may be persistent on your system. They tend to re-appear if not fully deleted. A malware removal tool like SpyHunter will help you to remove malicious programs, saving you the time and the struggle of tracking down numerous malicious files. Note! Your computer system may be affected by Microsoft System Security Alert and other threats. SpyHunter is a powerful malware removal tool designed to help users with in-depth system security analysis, detection and removal of threats such as Microsoft System Security Alert. 1. Install SpyHunter to scan for Microsoft System Security Alert and remove them. 2. Scan with SpyHunter, Detect and Remove Microsoft System Security Alert. Ransomware infections and Microsoft System Security Alert aim to encrypt your files using an encryption algorithm which may be very difficult to decrypt. This is why we have suggested several alternative methods that may help you go around direct decryption and try to restore your files. Bear in mind that these methods may not be 100% effective but may also help you a little or a lot in different situations. Note! Your computer system may be affected by Microsoft System Security Alert or other threats. Remove Microsoft System Security Alert by cleaning your Browser and Registry. Fix registry entries created by Microsoft System Security Alert on your PC. Combo Cleaner is a powerful malware removal tool designed to help users with in-depth system security analysis, detection and removal of threats such as Microsoft System Security Alert. Step 5: In the Applications menu, look for any suspicious app or an app with a name, similar or identical to Microsoft System Security Alert. If you find it, right-click on the app and select “Move to Trash”. Step 6: Select Accounts, after which click on the Login Items preference. Your Mac will then show you a list of items that start automatically when you log in. Look for any suspicious apps identical or similar to Microsoft System Security Alert. Check the app you want to stop from running automatically and then select on the Minus (“–“) icon to hide it. Remove Microsoft System Security Alert – related extensions from your Mac’s browsers. A pop-up window will appear asking for confirmation to uninstall the extension. Select ‘Uninstall’ again, and the Microsoft System Security Alert will be removed. When you are facing problems on your Mac as a result of unwanted scripts and programs such as Microsoft System Security Alert, the recommended way of eliminating the threat is by using an anti-malware program. Combo Cleaner offers advanced security features along with other modules that will improve your Mac’s security and protect it in the future. Hey !, I found this information for you: "Remove “Microsoft System Security Alert” Scam". Here is the website link: https://sensorstechforum.com/remove-microsoft-system-security-alert-scam/. Thank you.